You'll have time to work on your current project or start a new one (pick up a kit or pattern & supplies here) and we'll all sew together. We'll provide snacks & beverages. It will be a fun night to do something with others that love to do what you love to do! The Necessary Clutch Wallet isn't just your ordinary wallet. Carry your cell phone, checks, cash, cards, coins and still have room for your favorite lipstick or even personal items. With its closed ends, everything is safe and secure and there is never any worry about anything sliding out. The Range Backpack is a modern, slim backpack with a stylish fold over top closure, an outside zipper for quick and easy to reach accessories, and inside pocket. In this class, you will learn how to install purse hardware and how to sew with cork. Class will be taught by Judy. 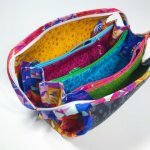 The Sew Together Bag is a multi functional bag and ideal for sewing supplies, toiletries, makeup, and more! 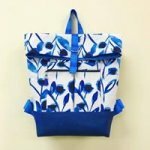 There are three zippered pockets and four open pockets on the inside. All of this is smartly held together by a zipper that forms two handles! Taught by Brittany.